Last week Charlie and I faced the realization that Fox is just about to outgrow the bassinet. We haven't put much effort into planning a nursery for him, just kinda went with the "cross that bridge" mentality. I guess it's time to cross that bridge. Over the weekend we bought an Ikea Sniglar crib which is now set up in our room. It will stay there for a few months, maybe longer. I like keeping my babies close by while we sleep. The downside to that closeness is that we don't have visually stimulating decor for an infant. A mobile seems like the perfect quick fix for that! Between daycare and his toys at home, Fox gets plenty of baby-themed visuals: the Winnie the Pooh mobile on his swing, plastic animal-themed noise makers on the baby bouncers, and the Non-sters thing that I never imagined he would love so much! Instead of another set of plush toys floating overhead, I've been thinking a mobile with a bit more graphic interest might serve him well. A few of my favorites: 1. 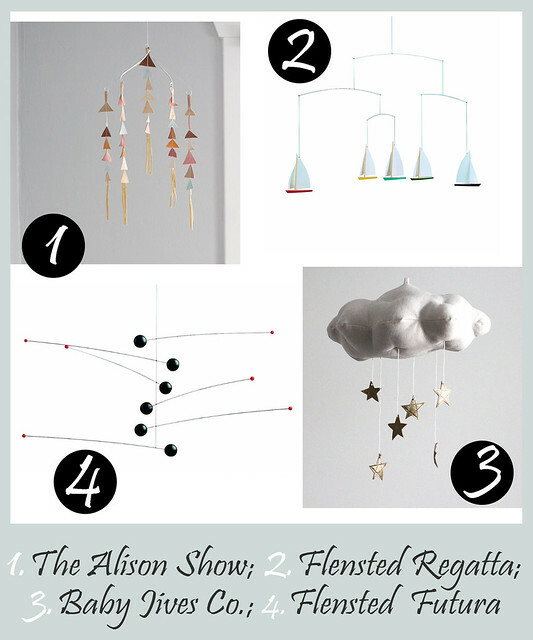 The Alison Show leather triangle mobile; 2. Flensted Regatta; 3. Baby Jives Co. Gold Star Cloud; Flensted Abstract Futura (small size).